With every new version update, WordPress adds something new to it’s features. Version-by-version you can notice the increasing power of this fabulous CMS software, and users expect more from them in every next update. Lets talk about the WordPress Admin UI, since we’re going to discuss about it in this post. If you get back to WordPress 2.x versions, you can notice the changes they have made in the whole user interface to make it more simpler, clutter-free and user-friendly. 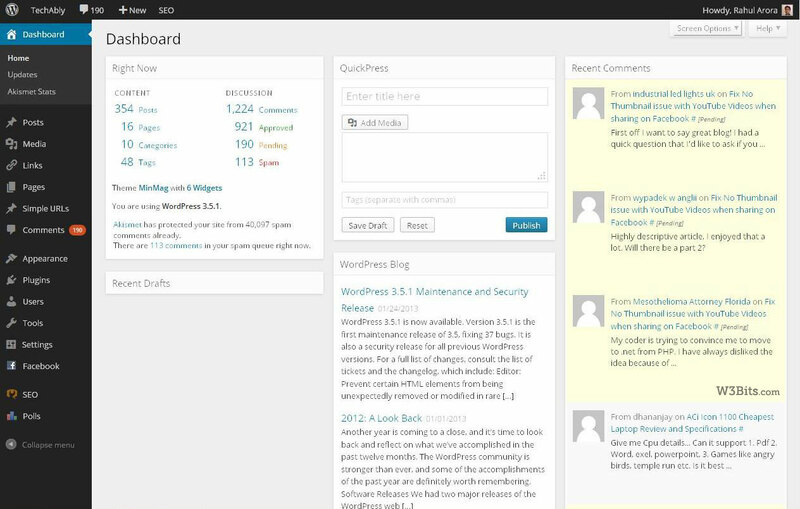 The current UI of WordPress is very simple and clean with light backgrounds and eye-soothing foreground colors. MP6 turns the left toolbar pane’s light appearance into pure dark one. For menu highlights, it uses the blue background in place of gray. The rest of the page background changes to gray color from pure white. It also makes the post editor more compact in appearance. It implements a new font Open Sans in the whole Admin area. On the whole, the admin area looks neat, clutter-free and more usable with MP6 installed on WordPress. The plugin is in testing phase and you may notice minor layout changes over overtime with the new updates of the plugin. The design-savvy users should install MP6 to unleash the future possibilities of WordPress Admin UI.